Find hotel near Musee Toulouse-lautrec (a ..
Musée Toulouse-Lautrec is a renowned art Museum which is dedicated primarily to the works of well-known painter Henri de Toulouse-Lautre. The painter was born near Albia and the Museum opened up in the year 1922. 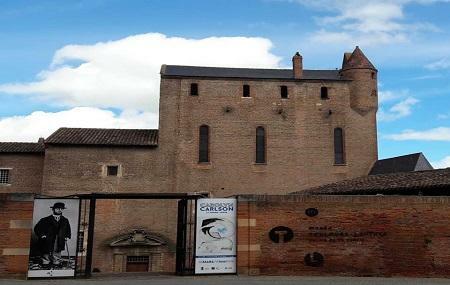 The Museum is situated in Palais de la Berbie which is Albi’s historic centre and formerly was the Bishops’ Palace. Musée Toulouse-Lautrec on this day houses over a thousand-important works of Toulouse-Lautrec which is also the largest in the world. It is based on the donation by the mother of the painter after he passed away in the year 1901. How popular is Musee Toulouse-lautrec (albi)? People normally club together Sainte-cecile Cathedral Of Albi and Circuit D'albi (le Sequestre) while planning their visit to Musee Toulouse-lautrec (albi). A reasonable art museum in wonderful historic building, unfortunately not achieving international standards you would expect. The section about Henri Toulouse-Lautrec and his art pieces is really nice and descriptions are also available in English. Many of his famous pieces are actually shown in reality, which makes it a great experience for every art lover. Unfortunately the temporary exhibition seemed very nice but was only presented in French. For a museum with that many international visitors exhibiting Giacometti I would have expected minimum an English translation. Very interesting and far more comprehensive than I'd anticipated. Startling how beautiful his early landscapes, portraits and animal interpretations (especially of horses) are. The museum - set in Albi's Bishop's Palace - is a marvellous setting, hovering over the river Tarn far below. Fascinating way to spend 1.5 hours in Albi.